The grotesque figure of the zombie was so distorted in appearance that it was highly disturbing. Its bizarre face and grotesque build were so scary to look at, and it really grossed me out. I prefer lighter movies that feature pleasant characters, not these horror films that feature grotesque or extremely ugly characters meant to shock and creep you out. Quiz: Try again! What does someone look like if he is grotesque? It looks like he didn’t take a bath that morning. He is misshapen and monstrous in appearance. He looks like he is disturbed by something. Grotesque Something grotesque is just gross. Grotesque ultimately comes from a root word meaning “grotto,” a cave or cavern (natural or artificially constructed) “hidden” away. Pictures found in excavated Roman buildings had elements of the grotesque in them, that is, they were somewhat “bizarre” or “outlandish,” and hence were appropriately “resembling” that which should be “hidden” away, and so were. Note: the letters “k” and “g” are often interchangeable across languages. 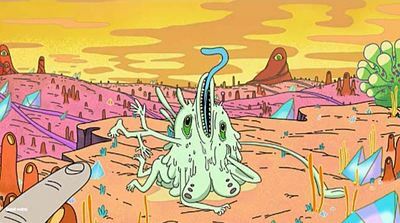 Rick and Morty The monster is grotesque.